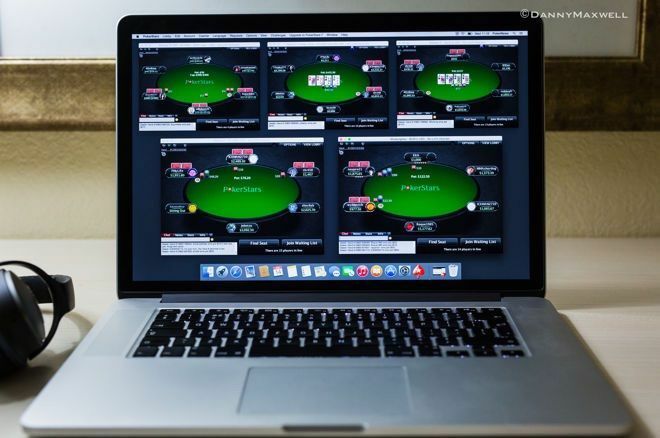 Gareth Chantler weighs the value of various bluff catchers in this analysis of a 100NL online hand. Some bluff catchers are better than others, as Gareth Chantler explains in this hand analysis. When an opponent pushes all in with a bet you suspect is a bluff, you can't wait until you have the nuts to call. You simply won't be holding the nuts often enough. Very often when facing all-in bets, your opponent will either have one of the strongest hands or one of the weakest. That means what you have — be it one pair, two pair, trips, etc. — doesn't matter that much if what you have is weaker than the nuts and stronger than nothing. What matters then in the distribution of this bluff-catching range is the card removal effects of the two cards you hold. Because of this, sometimes a one-pair hand could actually be a better bluff catcher than three-of-a-kind. Consider the following hand as an illustration of that point. The game was six-handed 100NL ($0.50/$1), played online, and began with an opening raise to $2.50 from the cutoff from an everyday Russian regular. It folded around to another regular in the big blind, a creative player from Greece who ordinarily plays lower stakes but on this day was in the middle of enjoying a nice upswing. He called, and the two players saw the flop come . The big blind checked, the cutoff bet $3, and the big blind called, making the pot $11.50. Things heated up after the turn brought the . This time the big blind checked, the cutoff bet $9, then the big blind check-raised to $28. After taking some time the cutoff called, pushing the pot up over $67. Stop... Hey, What's That Range? Let's pause it right there. Everybody look what's going down. Following such a sequence of events, there is good reason to think that the in-position player can have the nuts — — in this situation. That said, he probably can only have the four suited combinations, since opening queen-nine offsuit from the cutoff seat is quite loose. On the other hand, the big blind could conceivably have all 16 combinations of , as he could easily have defended his big blind with queen-nine offsuit. From there, all he would have had to have done is check-call (and not check-raise) the flop continuation bet. He could have even check-folded on that flop, since all he had was an overcard and a clean gutshot to the nuts. However — and this goes for -suited as well — smashing the turn is not an unbelievable event for the big blind's range. Looking at other strong hands possible for the big blind, one could expect a raise from flopped sets on the flop some amount of the time. So the key non-straight hands would be that did not three-bet preflop and that turned jacks up. All other strong hands are possible for the cutoff, including , -suited, -suited, and . In terms of possible bluffs for the big blind, looms large. With that hand he could conceivably defend all 16 combinations preflop (or at least all four suited combinations), but this on the turn has diminished the four nines in the deck as outs (as they would cause the board to four-straight 8-9-T-J). This, and having seven-high, makes check-calling the turn with unappealing, but the hand still has eight outs versus sets and could bluff pocket aces by the river. The river was the , making the final board . The big blind went all in for $84 (more than the size of the pot). Talk about battle lines being drawn. The cutoff had the big blind covered. Now the cutoff could very easily have the nuts. All he would have had to do is bet the flop with . Betting again on the ten turn then calling the raise with two overs and an open-ended straight draw is highly believable as well. However, as mentioned above, you can't just call potential bluffs with the nuts (or near-nuts). (What do they say about paranoia, how it starts when you're always afraid?) If the cutoff player only calls this all-in bet with -suited, -suited, and , he could find himself being bluffed out of the hand too often. Sure the cutoff can have the nuts sometimes, but not often enough. Assuming, then, that the cutoff suspects the big blind is bluffing, with what else in the cutoff's range could he call? Pocket aces, though it made top set on this river, is not an ideal candidate. The hands the cutoff is most afraid of running into are the straight-making and -suited. Pocket aces in no way blocks these hands. One might think, then, that pocket nines would be the best bluff catcher. After all it blocks both and doubly. The main issue with calling with this hand is that the cutoff probably does not have it in his river range at all. He would probably check the hand on the flop or the turn. That leaves . It is just one pair, but it is strong enough that it can beat the big blind's strongest bluffs, say or . It also makes 50 percent of all combinations impossible for the big blind to hold. If the big blind would indeed raise the flop with sets, then is leaps and bounds better for the cutoff to call with on this river than . In fact, it is twice as good as pocket aces, and perhaps as good as or . The cutoff player in this hand did in fact have . And he did in fact call. The big blind had to sheepishly table for an out-of-position float that turned into a semi-bluff, and the cutoff claimed the pot. For what it's worth, there's nothing too terribly blameworthy in terms of the big blind's turn and river play. After all, he did block and himself, the ace was a scary river, and he had just king-high. But let's commend the cutoff for finding a call with what turned out to be a very good bluff catcher, indeed. Hold'em with Holloway, Vol. 74: We're Back, Baby!